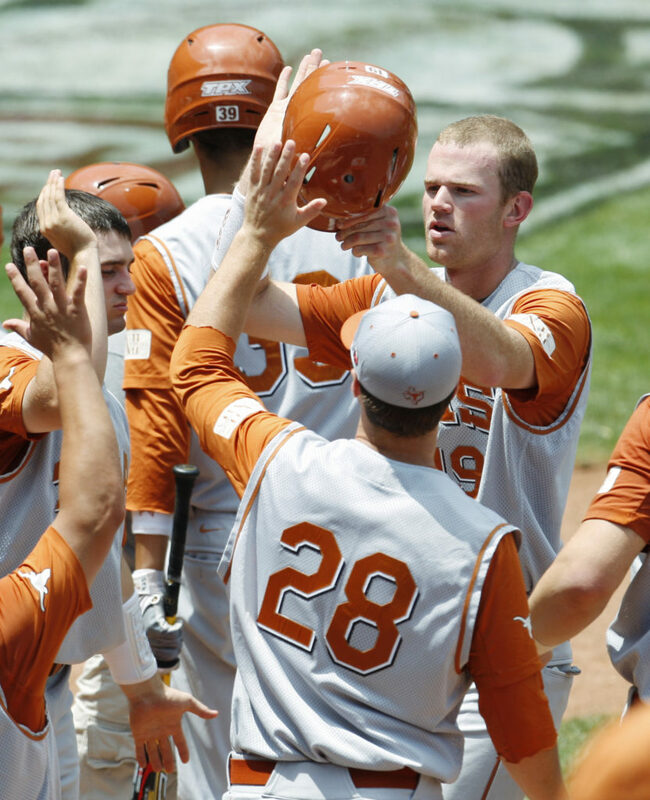 Texas' Kyle Russell, right, is greeted by his teammates after scoring against Kansas State in the third inning. Texas defeated K-State, 15-7, for the Big 12 championship on Sunday in Oklahoma City. Oklahoma City ? Augie Garrido believes winning the Big 12 championship was only the first step for Texas. After bowing out in the NCAA tournament regionals the past two years, college baseball’s winningest coach sees better times ahead for the Longhorns. Russell Moldenhauer had a career-best four hits and drove in four runs as the Longhorns locked up the 50th NCAA tournament appearance in school history in a matchup featuring one of college baseball’s most storied programs against one seeking its first ever trip to the NCAAs. The Longhorns (37-20) won the Big 12 regular season title the past two years, but struggled at the conference tournament and then lost during NCAA regionals in their home state. This time, they wound up in fifth place in the regular season but came through at tournament time. Seventh-seeded Kansas State (29-29) only made it into the conference tournament after sweeping rival Kansas at the end of the regular season and then made a surprising run to the Big 12 title game before running into Texas. “It’s a big step, but I really can’t say it’s been a successful one,” K-State shortstop Drew Biery said. Wildcats coach Brad Hill said he thought his hitters got “overanxious” during bases-loaded situations in the first and second innings that yielded only one run for the Wildcats. Texas then scored four runs in the third inning off Kansas State starter A.J. Morris (4-4). “We’d like to not be in a position where you have to win the tournament to be in a regional. … That’s the goal we’re trying to get to,” Hill said. Moldenhauer singled twice and doubled twice to lead a 19-hit attack for the Longhorns. He had run-scoring singles in the third and fourth innings as the Longhorns built a 9-1 lead. The eight-run difference was the most lopsided in Big 12 championship game history.